We are having some crazy weather for the second day in April. Isn’t it supposed to be Spring? Why does it look like a blizzard outside and feel like Christmas? I don’t know about you, but I’m ready for Summer! I suppose I will just have to make do with some hot chocolate tonight. Stay warm everyone! P.S. I just love her to bits! I hope all of you enjoyed this beautiful Easter day! We decided to take our goats for a walk today since it was so nice. This was the first time we had the moms and babies out together and the first time the babies were outside. Enjoy the pictures from today! As someone who has struggled with acne most of my life, it is so strange to be complimented on my skin. My skin care routine consists of using goat's milk soap and occasionally goat's milk and honey lotion; that's it! I even wear cheap makeup everyday, but as long as I wash it all off before bed; I don't get break outs from it. Not only is today Palm Sunday and the First Day of Spring, we had more goat babies born today! We had another set of twins born to our doe Baby and buck Elvis. The cou blanc boy (Blaise) was first, followed by a sundgau girl (Echo) who was backwards. They are both doing well. Enjoy the pictures! We had are first babies of the year born tonight! We had a set of twins born to our doe Peanut and buck Elvis. The chamoise boy (Eeyore) was born first followed by his sundgau sister (Pippa). Enjoy the pictures! Our goat's milk & honey lotion is a favorite among customers; whether you are too nervous to try our soap or you're looking for a little extra moisture on your hands or face. Our top customers are nurses looking for a good unscented lotion for their hands and older women looking for a nice face moisturizer. This lotion is extremely nice and a little goes a long way. It is non-greasy and soaks into the skin very well. It is always unscented! We currently sell it in 4oz jars. Do you have itchy skin after you get out of the shower? Do you slather on lotion after a bath? Does your skin feel sore and chapped when you're in cold weather? The reason for this is that the detergents in commercial soap destroy the oils on your skin. These oils are important in protecting your skin, keeping it hydrated, and maintaining the skin's elasticity. In need of unique gifts for Easter Baskets? Look no further than Sara's Suds. 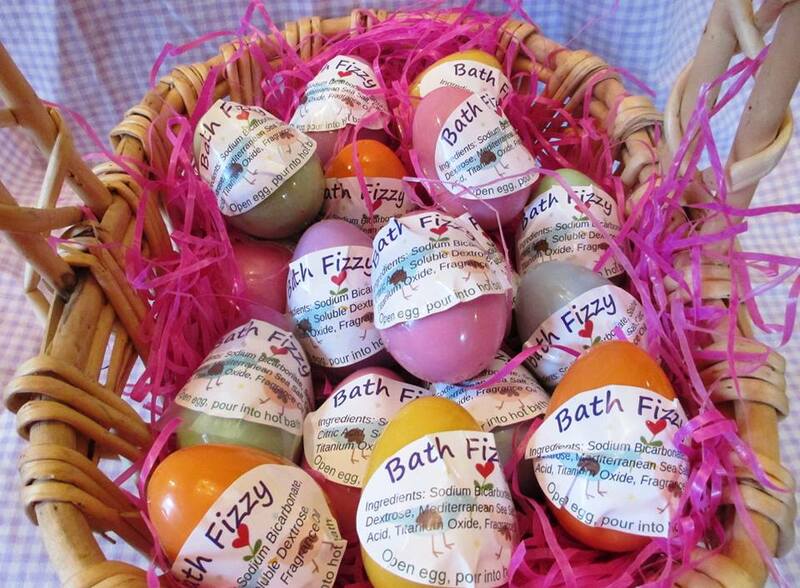 Bath Fizzy Eggs are only $1.00 and come in Cherry and Strawberry.